Arrrgh Mateys! 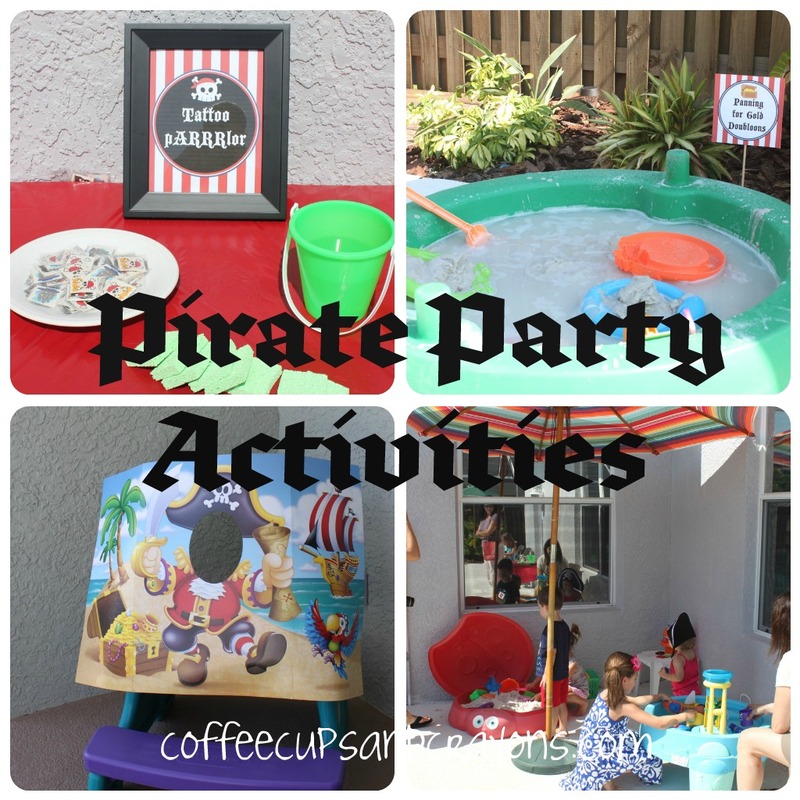 Grab an eyepatch and pirate hat and listen to the tale of how we threw a pirate themed birthday party! Ahoy landlubbers! Yo ho ho! We couldn’t have a pirate party without pirates, so the first thing we did was pass out eyepatches and pirate hats to everyone. And encouraged lots of pirate talk! Then as we waited for everyone to arrive the little swashbucklers went out back to play in our pirate themed stations. A “photobooth” area — okay it was really just a cardboard cut out we taped to the kids’ picnic table, but they loved it! And 3 cardboard pirate ships set up for cannonball practice! 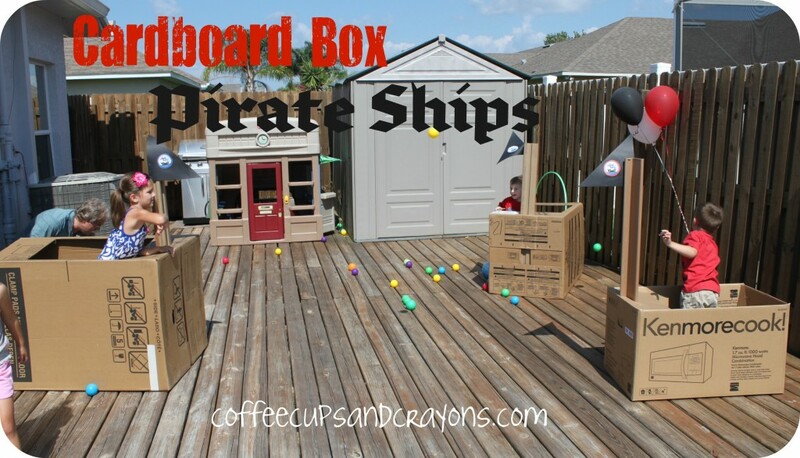 We stuck sails in our old appliance boxes, cut out areas for the kids to stand in, and threw bunches of ball pit balls all around. The kids tried to get the “cannonballs” into the other ships. This free play area was a huge hit! 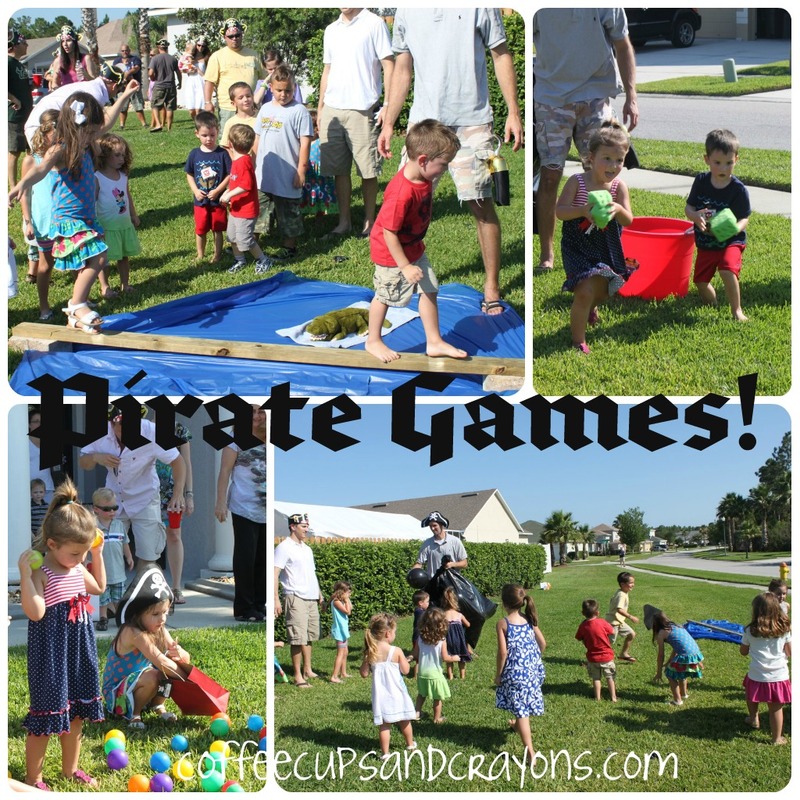 The pirates had a blast and the adults were definitely entertained watching their pretend play! Then once all the bucanners were there we were ready to find our treasure. But that sneaky Captain Hook had stolen our treasure and had put obstacles in the way of finding it! The kids had to get the coconuts, swab the deck, pop the cannonballs and walk the plank before they could reach the hidden treasure. Swab the Deck – To get through this challenge the kids had to dunk large sponges into a bucket of water then run across to the other bucket and squeeze the water into it. Pop the Cannonballs – Oh no! Captain Hook sent cannonballs (round, black balloons) flying everywhere, the pirates had to pop them before anything happened. Walk the Plank – Before they could reach the treasure they had to walk the plank without falling into the alligator pit. We made a plank out of a 2×4 on cinder blocks over a blue tablecloth. 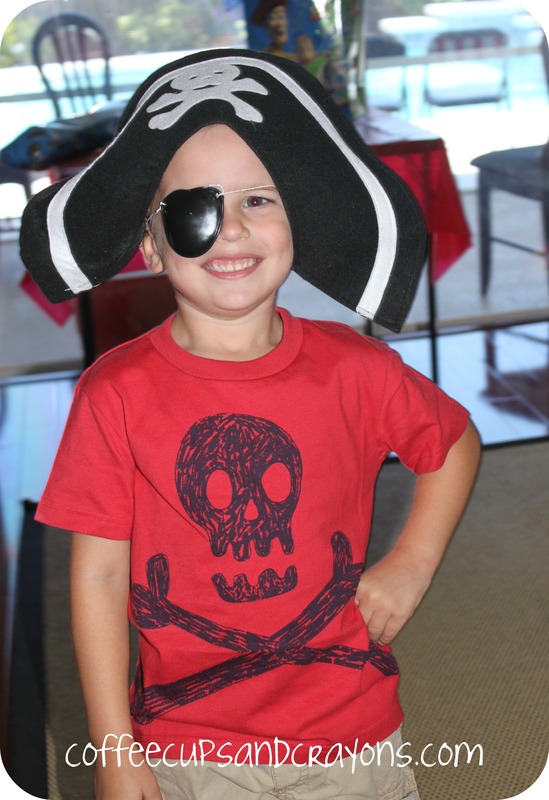 We did a little research into what pirates ate…and decided NOT to serve any of it at our party! Instead we went with shrimp cocktail, fried chicken, homemade mac and cheese, etc. 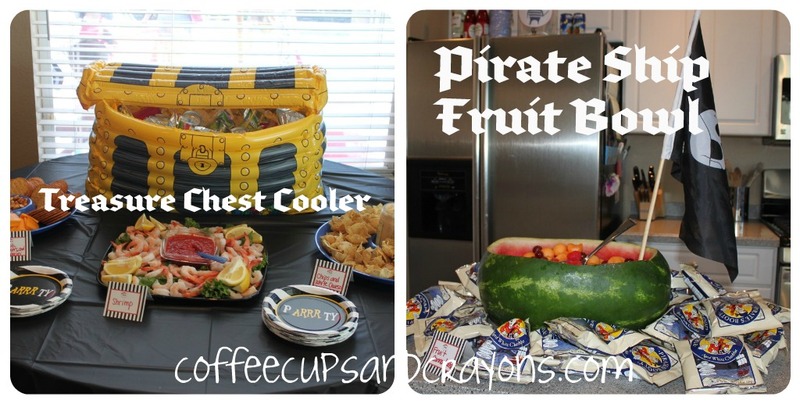 But we were able to add in a little bit of pirate-ness with a treasure box cooler and fruit bowl boat filled with melon and grape “cannonballs”! How cool are these party printables?!? 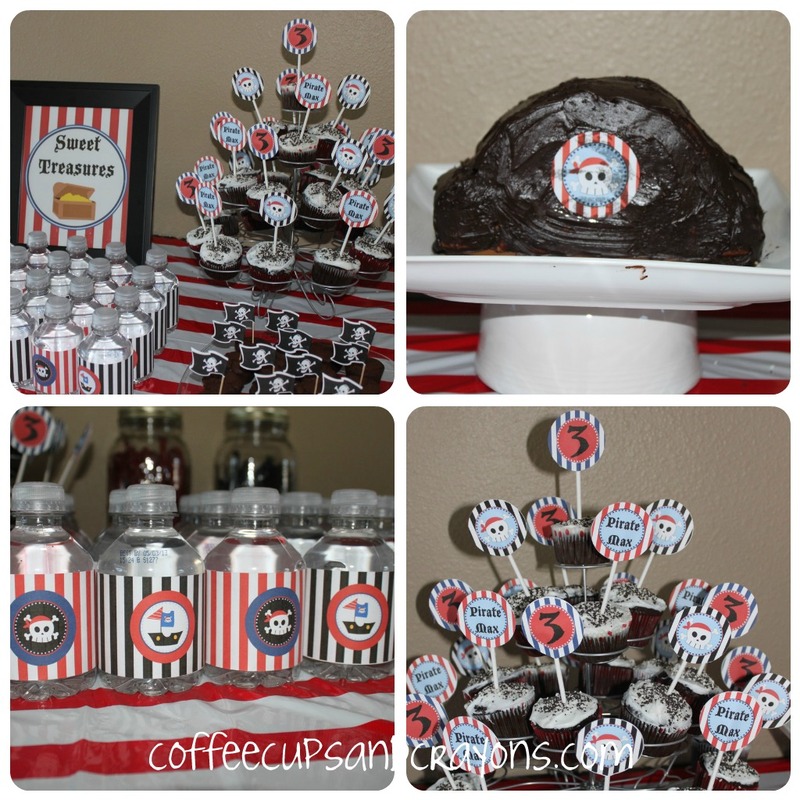 DimplePrints designed this fabulous pirate collection for us to use and we could not have loved it more! 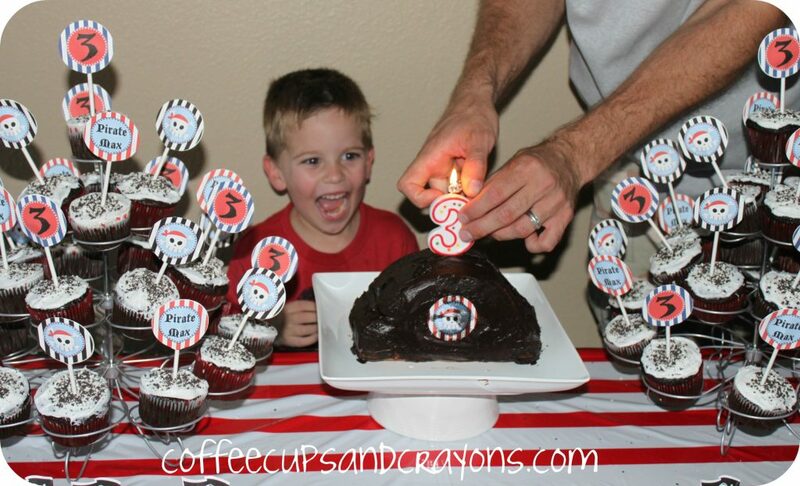 She has great party supplies and invites that she customizes for you to print and create at home. If you have not checked out her shop yet you must — there are so many cute packages to choose from! 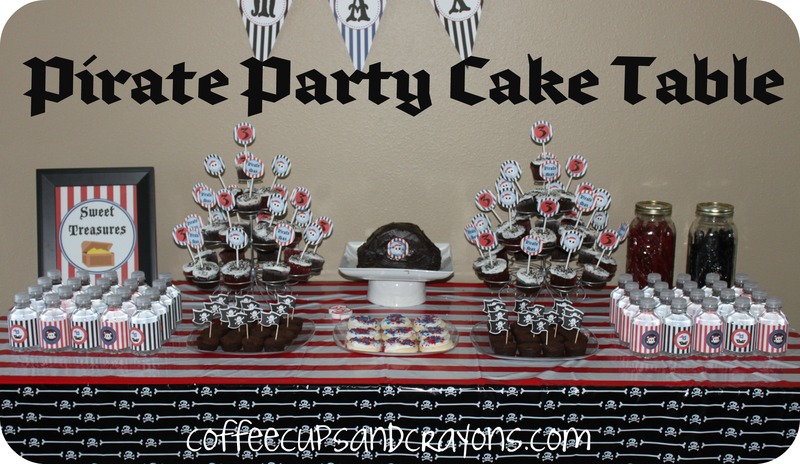 I had envisioned a chocolate covered pirate hat cake outlined in white icing with a 3 in the middle — simple and classy. Unfortunately, I forgot to do the cake until right before the party! As I was setting up the table I realized I was cakeless and quickly carved a pirate hat out of frozen pound cake. All I had time for was a quick coat of chocolate frosting and a cupcake topper. Not bad for the last minute, but not exactly what I had planned. If anyone has a cool pirate cake they’ve made email me the photo — I’d love to feature it instead! The birthday pirate had a swashbucklin’ good time at the party! Y0 ho ho! Super cute ideas! Where did you find your treasure chest cooler? Thanks Rachel! We ordered it from Oriental Trading.